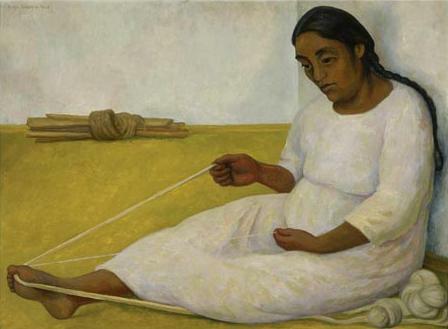 Diego Rivera began to study art in Mexico, but after some time, he traveled to Paris, where he mixed with the artistic community and became friend of Amadeo Modigliani (Picasso’s nemesis). But, artistically mature, he returned to his country. There, he worked two completely different motifs. On one hand, his murals. Rivera, a declared communist, painted murals across Mexico and USA. Next to David Alfaro Siqueiros, Clemente Orozco and Rufino Tamayo, the muralist movement of the beginning of the century, sought to educate people on Mexican history, although the murals had a clear political intention. On the other hand, Rivera devoted himself to the portrait of Mexican indigenous people, as a way to come to the roots and dignify his country’s identity. In Indian spinning, we see a woman spinning wool. The character is old and has a sad and empty expression. The physiognomy of her face, the braided hair and the color of her skin indicate us her roots that can be traced before the Spanish conquest. The painting wants us to think about the historical moment that Mexico was going through. After the failed Zapata´s revolution of 1910, the communist thought that the country would sink under the claws of capitalism and industrialization. The indigenous, generally uneducated and with no political leverage, appear, for the intellectuals, as victims of this process of marginalization and exclusion. And this is what today’s painting shows. ~ by Álvaro Mazzino on January 19, 2011. It tests the effects of increased EITC payments to childless workers earning up to $30,000 per year, including their levels of after-credit incomes, their participation in the workforce and their well-being. This entry was posted on January 19, 2011 at 10:36 and is filed under Realism.You can follow any responses to this entry through the RSS 2.0 feed.You can leave a response, or trackback from your own site.